LeMay – America’s Car Museum® will hold the 33rd Annual LeMay Museum Car Show & Auction at the Marymount Academy and the LeMay grounds in Tacoma, WA on Saturday, August 28, 2010 from 9am to 5pm. Make sure to seek out the display of Movie & TV Cars, where you will be able to meet the MMC staff in person, see replicas of the Red XA Bat and Interceptor from Mad Max 1 & 2, as well as many other famous star cars. 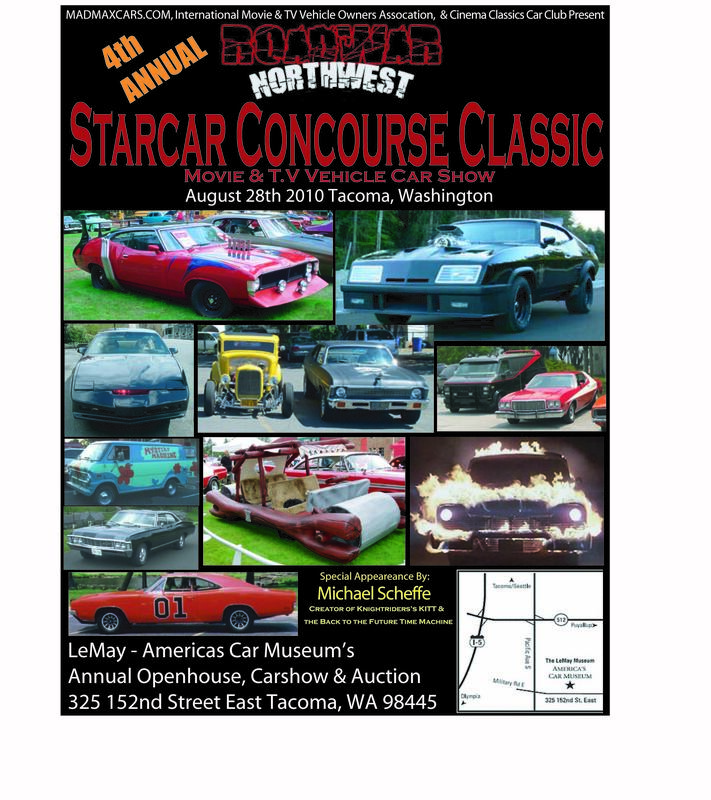 Visitors will also be able to see the over 1,000 vintage, classic and specialty automobiles, trucks, and motorcycles from the LeMay Collection, plus hundreds of local collector cars. In addition to the cars, there will be automobile-related vendor displays, and an auction of classic cars. Entry donations are $10 for adults, $20 for a family of 4, $5 for children under 12, and $5 for active-duty military. Free parking will be available offsite with free shuttle bus transportation between the parking lots, the Marymount Academy and the LeMay grounds. For more information visit the Lemay website at www.lemaymuseum.org or call (253) 536-2885. Once again we had a great turnout of Movie & TV Cars & Australian Muscle cars. This year included replicas of the Red XA Bat from "Mad Max 2 The Roadwarrior" and Interceptor from Mad Max , as well as a Mad Max themed "MFP USA Interceptor" based on a 1971 Torino, a Holden HX LE Monaro (one of only 21 known left in the world), a "Screen Used" KITT, a Desert Storm Humvee, and all of the other awesome show cars. All this as LeMay – America’s Car Museum® held the 32st Annual LeMay Museum Car Show & Auction at the Marymount Academy and the LeMay grounds. Many folks Sought us out at the display of Movie & TV Cars, and got to meet the MMC staff in person. This is also where they got to see the newly rereleased Abbyshot MFP jacket, Gloves, and Badges on a pair of MFP Officers in uniform. There was also a classic "Berserker" from Mad Max 2 / The Roadwarrior standing "Guard" next to the Red XA Bat. Visitors were also able to see the over 1,000 vintage, classic and specialty automobiles, trucks, and motorcycles from the LeMay Collection, including their contribution to the movie car genre; The Death machine from Animal House, Christine, Flintstones car, and more. Plus hundreds of local collector cars showed for pleasue, and LeMays first "Judged" carshow. In addition to the cars, there was automobile-related vendor displays, and an auction of classic cars. KZOK FM from Seattle was sponsoring the first ever Live Music stage at the show, and Spike O'Neal from "Spike & The Impalers" / radio personality with the KZOK Bob Rivers morning show was in attendance. LeMay – America’s Car Museum® held the 31st Annual LeMay Museum Car Show & Auction at the Marymount Academy and the LeMay grounds in Tacoma, WA on Saturday, August 30, 2008 from 9am to 5pm. We had a great turnout of Movie & TV Cars & Australian Muscle in it raw form, including replicas of the Red XA Bat from "Mad Max 2 The Roadwarrior" and Interceptor from Mad Max , as well as Mad Max themed Fan Vehicles, a Holden HX LE Monaro (one of only 21 known left in the world), and a genuing XB GT Falcon . Visitors were also able to see the over 1,000 vintage, classic and specialty automobiles, trucks, and motorcycles from the LeMay Collection, plus hundreds of local collector cars. In addition to the cars, there was automobile-related vendor displays, and an auction of classic cars. LeMay Auto Museum Spanaway. 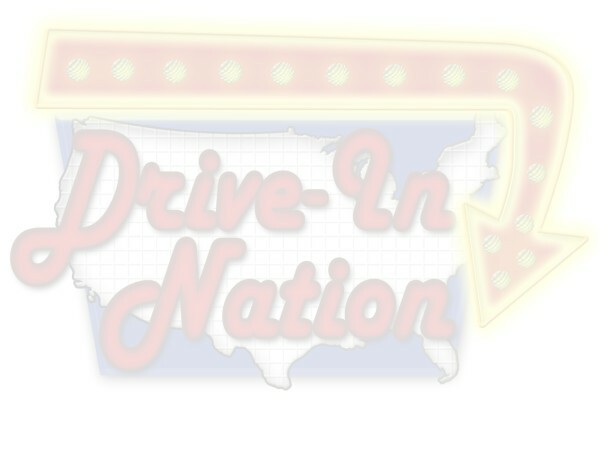 Valley 6 Drive-In, Auburn. This incredible event had a 3 part main event day on Saturday the 25th of August. 1)The Morning through afternoon Car show featured a Black on Black Pursuit Special, Red XA Bat (Wipeout), Unmodified Aussie Fords & Holdens, as well as KITT(Film Used), General Lee, CannonBall Run's Ambulance(Film Used), Starsky & Hutch Torino, Christine (Film Used), fans in costume, props & memorabilia, and WEZ (see below). The car show was hosted at the World Famous LeMay-America's Car Museum, on their biggest event day of the year, the Museum's Open House. Check out www.lemaymuseum.org regarding the "Open House" at the LeMay Museum, arguably the biggest car show of the year, every year, NATIONWIDE, of which the Roadwar N.W. event was a small, but very important part that year. 2) Following the Car show, A "Tanker Run" Cruse, began at the LeMay Museum, Lead by A "Tanker Rig", followed by all those awesome Mad Max Vehicles, and TV/Film Cars, in homage to the Tanker Scene from "Mad Max 2/The Roadwarrior". The local Gyrocopter club was planning on Flying overhead in up to 6 gyroplanes. Unfortunately due to late afternoon rains and related FAA regulations they were gounded, but we'll call on them again. 3)The "Convoy" ended at the Valley 6 Drive-In, for a spectacular giant screen double feature of the Australian releases of Mad Max & Mad Max 2 [known as the RoadWarrior in its usual US release]. We believe this was the First time in US history that both Mad Max 1 & Mad Max 2 were shown on the big screen, and certianly the fisrt time in a Drive-In with Replica cars, and Cast in attendance! Vernon Wells "WEZ", was at the event throughout the 3 day run, Talking with fans and signing autographs, and riding in the Tanker Convoy! There was also a Friday night "Pre-Party", with Live Music, Cars, Costumed fans, & WEZ! Sunday was a casual Brunch get together at the café 410 located near the local accommodations, to say our so-longs, and enjoy the atmosphere one last time before heading into the sunset. Log onto http://www.roadwarusa.com/roadwarNW/index.htm for details, a photo gallery and information future events. You wouldn't believe how many GT Falcons there were at the American Ford 100th Birthday Celebration. Not to mention The Goss Specials, Interceptor Replicas, and other awesome Aussie Fords. The cars continually pulled in huge crowds of people. John Goss was there signing everything from cars to shirts and books. All the Falcons took a run around the test track together. It was definitely a special time for everyone. The trip there and back were stories in themselves!! I think its the first (and only) time I have ever seen The Pursuit Special at the foot of "Devil's Tower". Close Encounters & Mad Max, what a mix! Jeff Green and I showed Jeff's Red Pepper 1974 XB GT Falcon at the Western Washington Fairgrounds Hot Rod Show on August 26th, the car at times pulled in huge crowds of people, to many to talk to sometimes, Lots of people thinking it was an Australian Mustang or Torino. This years show was at Caribbean Gardens in Scoresby Victoria. With only 5 coupes attended the show, there was 1 XB, 2 XC's, 1 XA and a Landau. The most impressive coupe of the show was the Green/Silver XB GT with factory sunroof. The other notable vehicles were the Grey/blue XC Fairmont also with a factory sunroof, unfortunately suffering from some rust around the tail light panel. The purple colored XA had a Landau front added where the hood had suffered from being flipped up at high speeds bending the hood rather drastically at the edges near the windscreen. I must say that I was extremely disappointed in the turn out, except for the Green GT all the cars were suffering severe neglect with rust and dents throughout. But on a brighter note I must congratulate those who spent the time to show their cars I only hope that next year there will be more in attendance.